Home :: News :: MH English School Building Inauguration and Anniversary Celebrations. MH English School Building Inauguration and Anniversary Celebrations. MH Edapal: MH English School Stands for the Enhancement of the Education of Edapal. The Annual Celebration of MH was conducted on March, 27th & 28th ,2013 . The Programme was Named as YAW 2013. The Annual Celebrations was inaugurated by Artist Namboothiri . In his Inaugural Speech he stressed on the Quality of Education. The New Building Complex was Inaugurated By the Hon’ Minister for Education Sri P.K Abdurrabbu. The Chief Guest of the Programme was Hon’ Panakkad Munawarali Thangal. The Meeting was presided by Sri K.T. 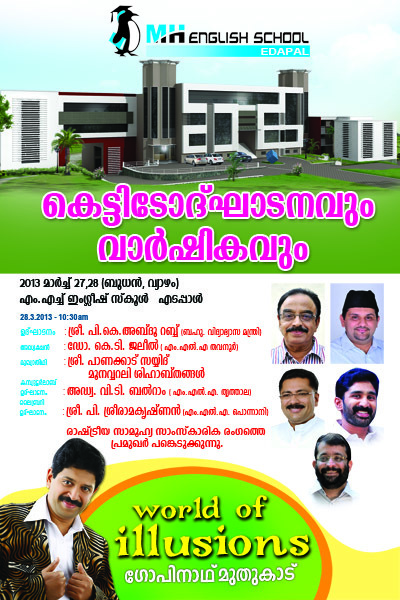 Jaleel (MLA of Thavanoor) and the Computer Lab was Inaugurated By Sri V.T. Balaram (MLA of Thrithala) and many other Eminent personalities participated in this programme. The Keynote Address was given by the Manager Sri. M.P.M Shareef and the Welcome Speech was Delivered By Mr. Sidheeq T.V, The Chairman of MH Trust. The Vote of Thanks was Given by Mr. Thelhath TV, Vice Chairman of MH Trust. MH YAW , The Arts Programme and Cultural Procession was Colourful and Ever Memorable. After the Arts Programme Prof. Gopinath Muthukad Presented The Magic , World of Illusions.